January to March are notoriously cold months in New England. These are the perfect time to run a series of mostly-indoor seminars on photography! All levels are welcome, from beginner to advanced. 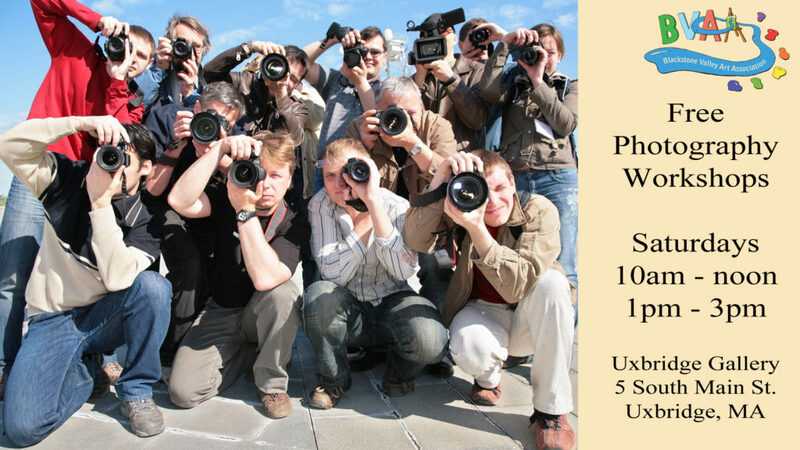 These are hands-on workshops so bring your camera! Cell phones are fine – we will use them to their best ability. All of our Saturday workshops are FREE and open to the public! If you can RSVP that is helpful, but if you find yourself free at the last minute, come on by. These are casual and fun. If you can only stop in for an hour, that’s fine. It is relaxed and stress-free. Be sure to check out our Anything Goes Photography Show – the reception is Fri Jan 18th from 4-7pm. The show runs through Feb 23, 2019. Also, don’t miss the fantastic Special Seminar – Stephen DiRado Photography Alzheimer’s Series. Learn more about photographing as a series and about this powerful topic. Here’s the current plan. Note that it is of course subject to change – weather in New England is notoriously unreliable in the winter! We’ll link to full pages for each one as we get closer to the events. What else would you be interested in? Let us know! All workshops are held at our Blackstone Valley Art Association / Open Sky (Alternatives) gallery at 5 South Main Street in Uxbridge. This location is fully handicapped accessible with no stairs at all. We are immediately next to a large free parking lot, so there are no parking issues at all. Contact us with any questions! Note that in addition to our free workshops we’re also planning a few for-pay workshops on Sunday which involve supplies. The costs in these workshops primarily cover those costs of supplies. Here is what we’re planning. We will let you know when we get dates for these. Again, ask with any questions!